Buy The Snow Cave Man on internet/VOD – click here. Buy The Snow Cave Man on DVD/Blu-Ray – click here. DVD/BluRay available with English, German, French and Spanish subtitles and lot’s of funny bonus material! 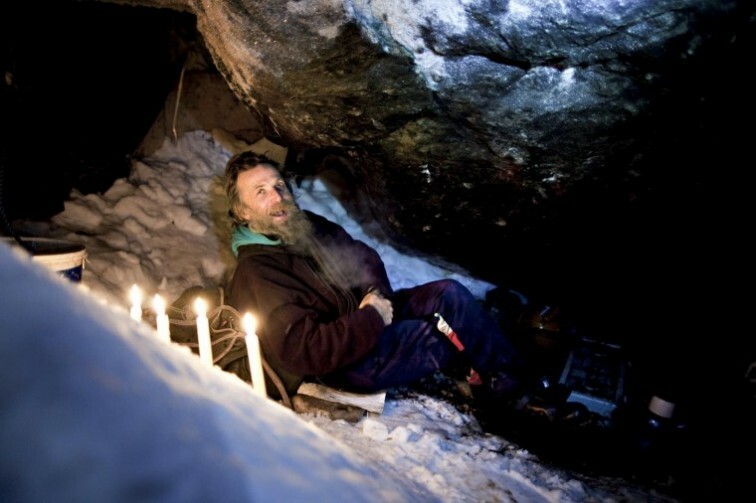 The Snow Cave Man has lived in snow caves high up in the barren Norwegian mountains for 30 years. Like Nietzsche’s Zarathustra, he has developed his own morale code and a biting sense of humour. He is a true environmentalist, but in his own way. Living among the blizzards and reindeer his life is far from the bourgeois materialistic life of the modern Scandinavian welfare state. The Snow Cave Man is shocked to receive the news that his mother has passed away. She leaves behind a clear message to him in the form of an ultimatum: In her last will and testament he inherits her apartment in the city, valued at appr. € 100 000, on the condition that he lives in the apartment or uses the money to purchase other form of permanent housing and settles down like a normal person. What will The Snow Cave Man do? Give up his life as a free spirit in the mountains – or forfeit the money from his inheritance? Danish Adventure Film Festival, December 2011. FIFAD Film Festval, Switzerland, August 2011. Premiere Norwegian theatres 12. March 2010. Premiere National TV2 May 2010.